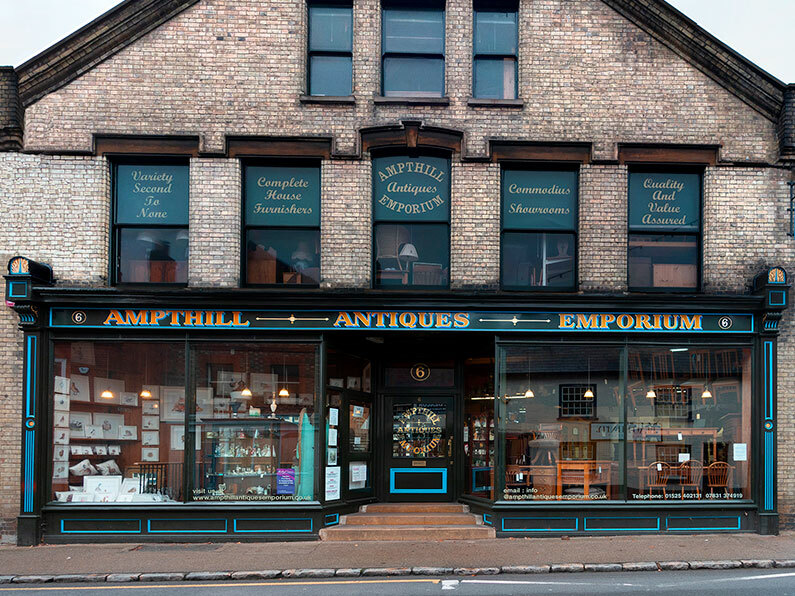 The story of Ampthill Antiques Emporium dates back to Victorian times when the Rushbrooke family opened their department store in Ampthill. In the early 20th century it changed its name to Pecks and traded successfully until 1979 when the store was closed. Mr Reg Bradley acquired the shop and opened the Emporium selling the premises later to Marc Legg. The business now flourishes as an antique emporium offering much that was available at the outset of the Rushbrooke dream. Marc Legg has gone to enormous lengths to rescue the building from neglect and seriously advancing decay so that it now forms a key feature in the newly restored Bedford Street. It is an amusing thought that some new furniture bought here in the early 1900’s by young couples setting up home is now being sold from the same premises as antiques for purchase by contemporary buyers looking for the same style, quality and value. From inception nearly four decades ago The emporium quickly found favour from private buyers and dealers alike, quickly establishing itself as a go destination for Antiques and decorative homewares. In its infancy focusing largely on traditional antiques. Over time the Emporium has continued to evolve and adapt embracing new ideas reflecting changing tastes and lifestyles. As such we now carry a larger stock than ever of items to suit all tastes and pockets. Antique, Vintage, Retro as well a small carefully selected capsule collection of contemporary items suitable for both home and garden. Ampthill Emporium remains the place to find those items you never knew you wanted.